Dr. Sharman's CLL & Lymphoma Blog: How do ibrutinib and idelalisib work? How do ibrutinib and idelalisib work? The substance of the article is that the B-Cell Receptor (aka antibody or BCR) from patients with CLL continuously triggers cell growth because it reacts with itself. The BCR is the one of the main determinants of B cell fate. It has long been suspected that the CLL cells may encode a BCR which recognizes either something inside of a patients body or perhaps even is triggered by an external stimulus that is common such as Tom Kipps earlier paper indicating that it might be part of the CMV virus that is recognized. In either case, constant signaling through the BCR gives an unending "growth signal" to the cancer cells. It adds to the argument that the BCR signaling pathway therefore represents a key "node" in B cell survival - ie. it is one of the main "pro-growth" factors in CLL. It follows therefore that drugs that interrupt this pathway would interfere with the growth / survival signals given by the receptor. Since the first three enzymes in the pathway are Syk, BTK, and PI3K it is not a surprise that drugs affecting these three enzymes act in similar manner. Double click on the image if you actually want to be able to see it. 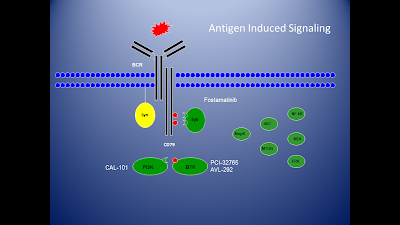 Fostamatinib (syk) led the way and showed that the target was of value but the drug has had a difficult time gaining traction as the main development focus of the drug was for rheumatoid arthritis. Richard Miller (CEO of pharmacyclics at the time and occasional attending physician at Stanford) had the opportunity to see some of our patients respond to fostamatinib. His company was developing a drug PCI-32765 (only recently named ibrutinib) which in hibited the next enzyme in the pathway - BTK. He got it polished up for a clinical trial which we developed over several weeks. Ibrutinib is a remarkable drug in CLL and much has been written about it. Much more will be written about it. About the same time a small Seattle Bio-pharmaceutical company had created a drug that inhibits PI3K - the next enzyme in the pathway. PI3K is a little different in that it integrates important signals from a variety of cell surface receptors. Those signals that tend to make a cell survive turn on PI3K and those that signal cell death turn off PI3K. PI3K is actually a large family of proteins but the "delta-isoform" seems to be specific for B cells. Their drug initially called CAL-101 (after one of the early founders of the company turned onto highway 101 in Palo Alto and decided that would be the name of the drug) now renamed GS-1101 (after acquisition by Gilead) shuts off PI3K and has considerable reported activity in CLL and NHL. 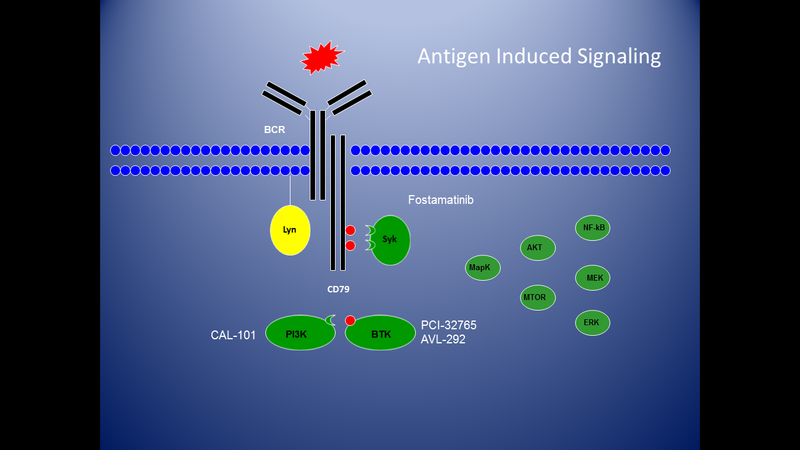 The point is the following: CLL cells proliferate in response to signaling through the B cell receptor. Drugs that target the pathway that transmits the signal inside of the cell turn off that proliferation and make the cancer cells less able to survive. The new finding in Hasaan's paper is that the source of the signal may be that the B cell receptor reacts with itself instead of the invading micro-organism it was supposed to attack. Building a better CD20 antibody?